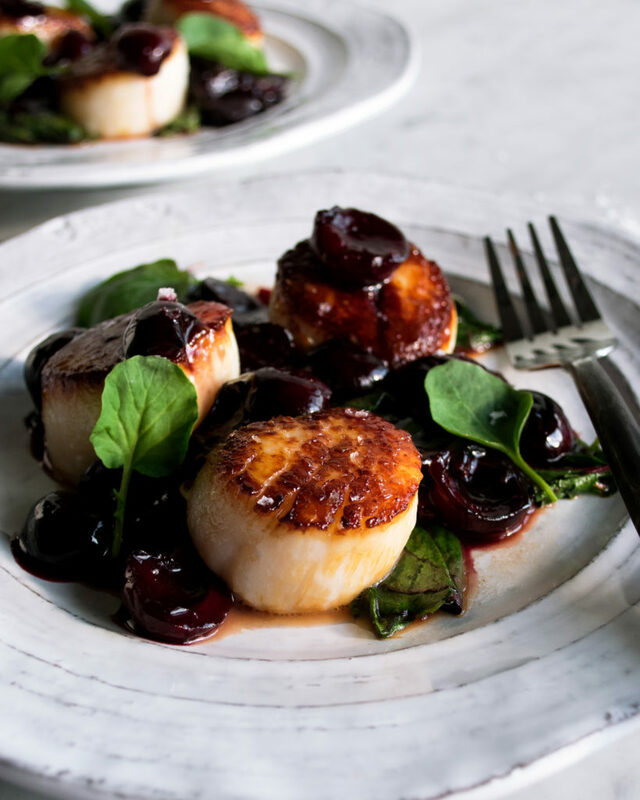 These scallops with cherries & wilted greens are going to become your new must-make dish of the summer. They’re rich, buttery, and so easy to make. Scallops seem to be something that so many people tell me they really love, but never cook. I honestly just heard it again the other day. I think seafood in general is a less commonly cooked item in people’s homes. But, I want to change that…with this simple little dish. Here’s the thing about scallops. 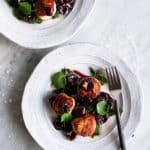 All you need are dry scallops, a hot pan, a little bit of oil, and a quick sear to create the most luxurious scallops ever. Well, and some butter, which I usually add a generous amount of in the sauce I’m serving them with. If you can keep the following tips in mind when cooking scallops, you will be golden (and so will your scallops!). Note: Some scallops have a small muscle attached to their side. You’ll be able to notice it at a glance, or you can feel for it. Simply use your fingers to peel it off and discard before cooking. 1. Dry and hot are two big keywords to remember. If the scallops aren’t dry, it’s a lot harder to form a really nice crust (that goes for any meat or fish as well). They’ll essentially just steam and become somewhat soggy. And, if both the pan and oil aren’t hot, the scallops will either stick or simply flop on the whole searing aspect. Let the pan heat first, then add and heat the oil, then add your dry scallops. In that order. 2. I’m sure you’ve heard this one before, but don’t overcrowd the pan. The scallops need space if they’re going to sear properly. Crowding will cause steam, and again, sogginess. 3. Next thing to remember is not to mess with the scallops before the crust forms. You don’t want to place them in the pan and then immediately try to move them around. Let them do their thing until you can visibly see brown edges around the bottoms. 4. And lastly, in an effort to avoid ever eating a rubbery scallop, do not overcook them! A couple of minutes on each side is all you need. Once the first side has that beautiful crust, flip it over and give it just another minute or two. Oh, and you’ll also need salt. A good seasoning is essential for anything to taste good! Once you have the scallops perfected, I love making dishes like this where there’s just a few other components…all really simple and meant to enhance the scallop’s flavor. 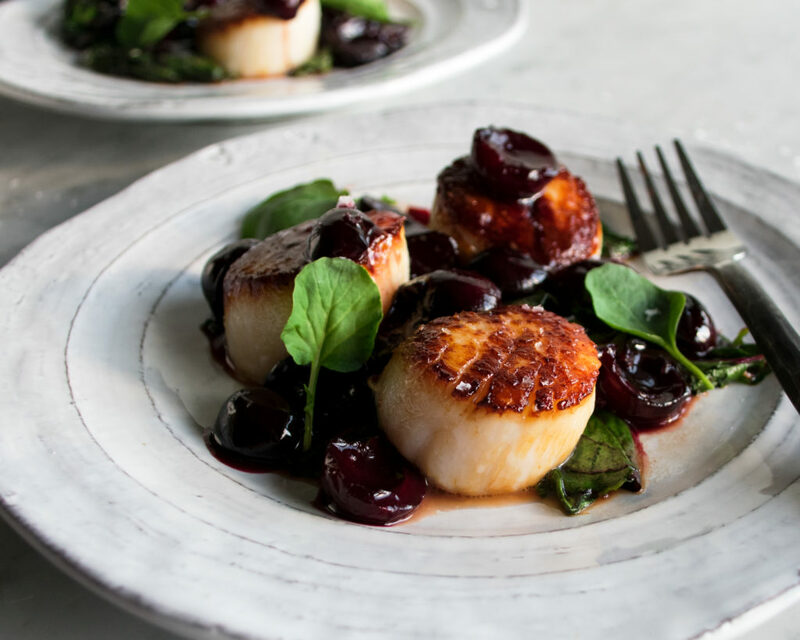 I adore cherries and try to constantly use them in my cooking when they’re in season. So, I made a really quick cherry sauce by reducing them down with a little bit of soy sauce and brown sugar. Wilted greens round off the dish, and a garnishing of watercress and sea salt makes it look like something extra special…with very little effort. Trust me, if you like scallops, you NEED to try this recipe. I hope you love it! 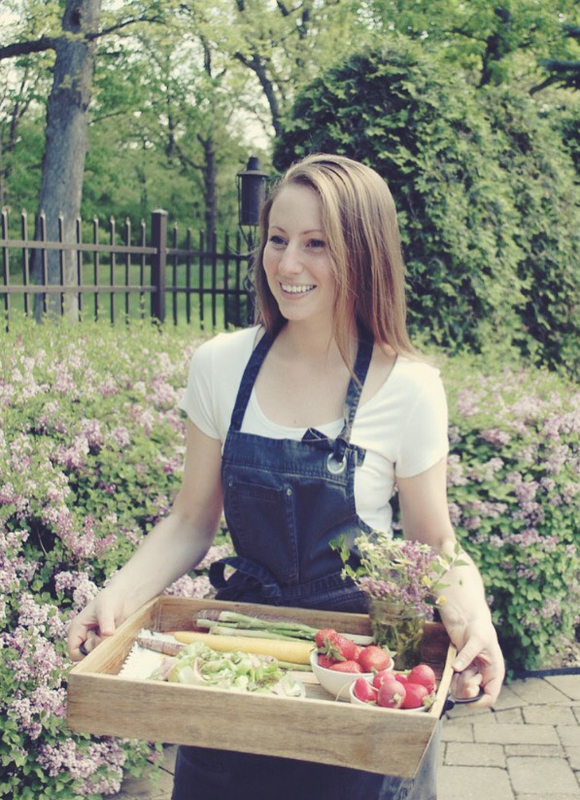 Here’s a similar recipe with blueberries and fennel slaw, too. 1. In a large sauté pan, melt the 2 tablespoons of butter over medium-high heat. Add the cherries and let cook for about 5 minutes until slightly softened. 2. Stir in the brown sugar and soy sauce. Let the sugar melt and the mixture come to a bubble. 3. Reduce the heat to medium-low and let the sauce gently simmer until syrupy, about 8 more minutes. 4. Turn off the heat and stir in the remaining 1 tablespoon of butter. Season with salt to taste. 1. Pat the scallops dry with paper towels. Season each side with a good pinch of salt. 2. Heat a large sauté pan over medium heat. Add enough oil to just coat the bottom of the pan. When the oil is hot, place the scallops in the pan (work in batches if needed; don’t overcrowd the pan). You should hear a sizzle. 3. Sear the scallops for just 1-2 minutes on each side until golden brown and cooked through. Transfer the scallops to a plate and keep warm. 4. Add a little bit more oil to the pan and add the chard. Let the chard cook until wilted and tender. Season with salt, freshly cracked black pepper, and lemon juice to taste. 5. 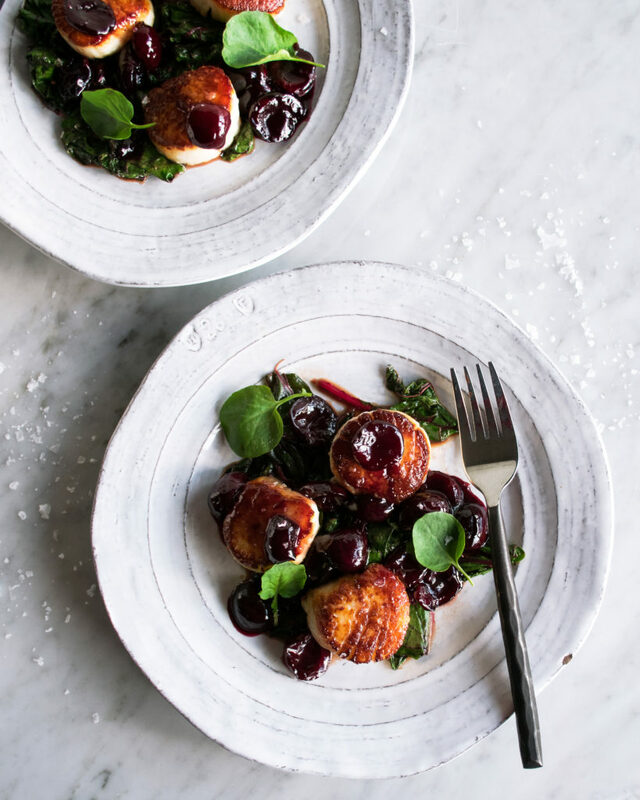 Plate the scallops and greens, spooning the cherries and sauce over top. Garnish with watercress and flaky sea salt.